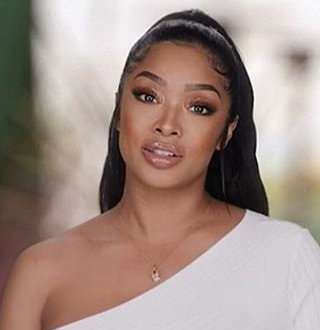 34 years old American reality star Princess Love is rocking her motherhood in 2018 as a new mother to beautiful daughter, Melody - her first child from her first marriage with rapper/songwriter Ray J. Fascinated by fame, Love, landed early in the entertainment industry, but she certainly got her ultimate stardom as a cast in Love and Hip Hop: Hollywood, an American reality show, in its 5th season. Here are some wiki facts; about Princess Love. The former girlfriend of the boxer, Floyd Mayweather Jr., was born on August 14, 1984, in Oakland, California, The United States. Being born in the USA gave her American nationality, but there is more to Love's ethnicity as she was born to an African-American father, Hugh Love, and a Filipino mother. According to wikis, her mixed racial parents separated when she was just five years of age, giving her a way to build bonding with her grandmother. The talented actress' real name is Princess Pilipina Love Norwood and she stands at a height of 5ft. 4inc. Princess had it in her blood to make out huge in the entertainment industry. But the famous Hollywood star was once hovering the poles of adult clubs in Las Vegas as a stripper before planning something before for herself. Want some references? She quit stripping and started seeking out opportunities in modeling where she managed to get a blast as a CoverGirl in the SMOOTH magazine (2012). After her short-lived modeling career that lasted until 2014, she transitioned into reality tv joining Love and Hip Hop: Hollywood. It is through the show she got her much aspired exposure and chance to meet up popular personalities such as Ray J! In March 2017, Love’s insta fan flooded insights on her weight loss when she shared her ‘before and after’ picture(now deleted), revealing her opinion about the urge she felt to lose weight. In the post, she opened up about her vegan and alcohol-free diet that helped her lose 40 pounds slimming her down from 163 lbs to 123 lbs in the timespan of 7 months between 2016 and 2017. However, losing 40 pounds wasn't enough for the reality tv star, she lived up to her status as a fitness-savvy celeb, cautiously going through a diet and workout plan even during her pregnancy in late 2017. Taken the vows and spelled ‘i dos’ in a way as charming as of royalties in August 2016, Princess Love and Ray J shared their euphoria of being parents-to-be in November 2017, a year after their marriage. "Princee and I, We’re expecting, I'm nervous, excited"
Together, the new parents welcomed their baby girl in May 2018, naming the beautiful as Melody. 5. But Wait! Didn't Ray J Cheat On Princess When She Was Pregnant? Sadly, it's true that the then overjoyed father-to-be, Ray J, hooked up with another woman, cheating on his four months pregnant wife, Princess. The jubilant mother-to-be must have been outraged upon the cheating husband, but the couple sorted out their issues before their daughter's baby shower party. Post-patch-up, the pair are raising their daughter together, and we the fans have been happy to witness the couple revive their relationship. The cherished parents of four months old couldn’t stop posting cute snaps with baby Melody after safely surviving an emergency landing (private jet underwent pressure in the cabin while flying from LA to NY). The pictures are too cute to be ignored and gives a hint of joyful family time. Ray must now be in a dilemma of whom to call Princess now? - Wife Princess or daughter Melody? 7. What Is Princess Love’s net worth? A graduate of designing, Princess, is reported to have collected a net worth of $2 million while her husband is worth $6 million. There are certainly possibilities for this aspiring American actress to boost her income as she goes on getting her hands on bigger deals.